The Story of Mets! How Does Kidney Cancer Spread? This X-ray image shows metastatic bone tumors in a mouse with kidney cancer. 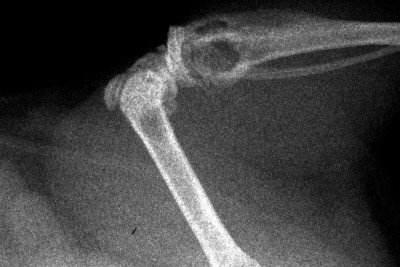 The metastatic tumors appear as hollow or dark areas in the bones. Metastasis, the process by which some tumors spread from their site of origin to other body parts, accounts for more than nine out of ten cancer-related deaths. But scientists still know relatively little about the genes and biological processes that cause metastasis to occur — information that potentially could translate into new ways to stop cancers from reaching advanced or terminal stages. Now a Memorial Sloan-Kettering research team has shed light on the mechanisms by which kidney cancer metastasizes to distant organs, including the lungs, bone, and brain. Published in the journal Nature Medicine in December, the findings point to potential therapeutic strategies to control the spread of the disease. The study also offers scientific insights that could advance metastasis research in other cancer types. The research was led by cancer biologist Joan Massagué, Chair of the Sloan-Kettering Institute’s Cancer Biology and Genetics Program and Director of the Metastasis Research Center. In recent years, his laboratory has uncovered basic causes of metastasis in a number of cancer types, including breast and lung cancers. In the vast majority of patients, clear cell renal cell carcinoma (ccRCC) tumors carry DNA changes in a gene called VHL. These mutations have been shown to cause the formation of primary kidney tumors, but they do not necessarily lead to metastasis. Until recently, researchers did not know what makes some renal cell carcinoma cells capable of forming secondary tumors in distant organs. In the recent study, the team addressed this question by performing experiments in mouse models and cell lines, and by analyzing biological and clinical data from more than 700 patients with ccRCC, whose tumors had been analyzed in large-scale cancer genomics projects. They discovered that two genes called CYTIP and CXCR4 are activated in metastatic tumor cells but inactive in non-metastatic cells. Their experiments suggest that the activation of the two genes might be essential for the spread of kidney cancer. “CXCR4 has been linked to metastasis before in this and other tumor types, including breast cancer,” Dr. Vanharanta says. “Now, our study shows that blocking CXCR4 function with a drug called plerixafor can reduce kidney cancer metastasis in mice.” Plerixafor (MozobilTM) is currently used to stimulate blood stem cells in some cancer patients treated by bone marrow transplantation. The researchers plan to investigate further whether CXCR4 and CYTIP, and other genes identified in the study, might offer new targets for the development of more-effective drugs for kidney cancer. In addition, the investigators explored the mechanisms by which the CXCR4 and CYTIP genes are switched on in kidney cancer cells to incite metastasis. Their study revealed that the genes undergo a series of epigenetic changes — modifications in the proteins that package a cell’s DNA and regulate genes. Unlike gene mutations, which alter a cell’s genetic code, epigenetic changes leave the DNA sequence unaffected. Nevertheless, such changes can influence a cell’s behavior by switching individual genes on or off. Epigenetic modifications are commonly seen in many types of cancer and have recently been associated with more-advanced disease. However, little is known about the specific genes and mechanisms by which tumor cells may reconfigure their epigenetic makeup, causing a person’s disease to progress and establish itself in new organs.
. If YOU want to follow my fight against Cancer from when it started and I first presented with symptoms in 1998, see The TAB just below the Header of this Blog. called >DIARY of Cancer< just click and it will give you a long list of the main events in chronological order. Thoughts and comments will be in chronological order in the main blog and can be tracked in the >ARCHIVE< in the Right Sidebar. You may find the TABS >MEDICAL LINKS< and also >CANCER LINKS< of help. YOU are welcome to call me if you believe I can help in ANY way. .
← And for a change A HEART ATTACK!